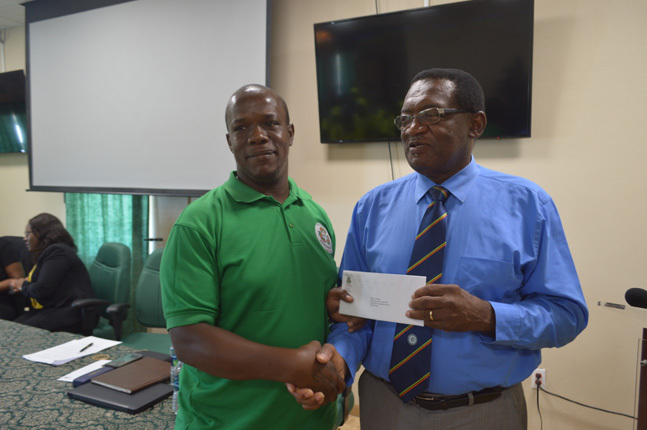 Minister Eugene Hamilton presenting a letter indicating salary adjustments to Sylvester Wattley, a landfill employee at the SWMC during Monday’s general staff meeting of the Corporation. Mr. Wattley is one of 65 staffers at the SWMC who have received salary increases retroactively from April 1st. Minister responsible for the Solid Waste Management Corporation (SWMC) Mr. Eugene Hamilton announced on Monday a salary increase for three categories of workers at the Corporation retroactive from April 1, 2019. The three categories of workers are: truck drivers, landfill workers and drain sweepers. The minister disclosed, during a general staff meeting of the SWMC at the corporation’s headquarters in Taylor’s Range, that the increase will benefit some 65 workers. “Starting from the first of April…those three categories that I mentioned, and I think the Chairman mentioned the number—65 I heard him say—will see their salaries changed because they will be placed in the new salary scales and in each case everyone will see a top up,” the minister said as staffers applauded. The minister said he made the recommendation to the board and management of the SWMC to adjust the wages of three categories of workers after what he called ‘walking a mile in their shoes.’ In January after the new garbage trucks were first commissioned, Minister Hamilton worked a few hours as a loader on one of the new trucks in his constituency to get a firsthand look at the challenges the workers go through in performing their duties. “In was a joy for me on that morning to go and handle some of that garbage but I must be honest with you. It caused me to make an instant change to how things were working in my mind because the very first garbage bin that I took up and decided to dump that garbage not only was the scent outrageous but there were some maggots streaming all over the place,” Minister Hamilton said to laughter from the staff. “I said: this is the condition in which my people work? My goodness! And so I decided ‘what can I do to give you some encouragement to help you in this messy but important task. And so I asked the board and the management to look at the prospect with treating with adjustment in wages for at least three categories of workers: those who drive the trucks, those who sweep the drain and those who work at the landfill,” the minister added. Meanwhile, Chairman of the Board of Directors Mr. Ivan Hanley expressed gratitude to the staff for their hard work and said that the board and management are working to continue to improve their working experience. He also disclosed that due to the improved financial performance of the corporation, the $1.5 million annual subsidy from government has been withdrawn, which means the SWMC will now have to work hard to ensure its good financial performance continues. “For the past 20 years, the corporation has been subsidized by the government. As a matter of fact, we were given $1.5 million per year. However, the financial secretary and her team have reviewed our performance and our accounting and they have deemed that the corporation now can stand on its own so we are no longer getting that $1.5 million,” Mr. Hanley disclosed. “That’s good and that’s bad. It is good from the perspective that they have seen that we have improved, they have seen that we are responsible and they have seen that we are taking the business of solid waste seriously. However it means that we have to work harder internally to make up for that 1.5 million that we became accustomed to receive from the government,” the chairman added. At Monday’s general staff meeting, the SWMC used the opportunity to update staff on the progress in the various departments. Subsequent reports on this meeting will be released in the coming days.